Eclairs, profiteroles, Paris-Brest, cream puffs… whatever you like to call them and whatever shape, they are my go-to indulgence every time. Not too sweet and with opulent waves of fresh, whipped coffee cream in the middle and a chocolate ganache glaze on top. Did I mention they are ridiculously low in sugar? There is a bakery in Edgecliff that makes the most perfect mini eclairs. Just like I remember from when I was a little girl. We were quite spoilt actually. Within a short distance from our house were two artisan bakeries and three excellent patisseries specializing in Polish and French treats. Every Friday afternoon, following ice skating training Mum would take me to the shop on the corner of Karmelicka Street and treat me to my favourites. 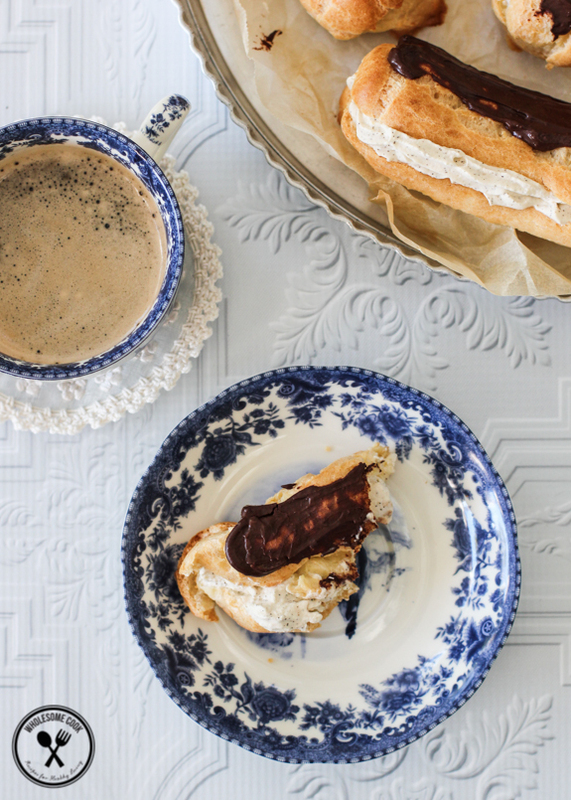 Chocolate glazed eclair with a fresh cream filling. They were so good. Everytime I think of those moments I crave their undulating pastry, light creamy filling and that sweet chocolatey icing. Once, I was so eager to get to my treat, I cut not only through the string tied around the tastefully wrapped box, but also the skin on my finger! Today, some 20 years on, I still have a faint little scar on my pointing finger reminding me to treat myself to a fresh cream eclair or cream puff from time to time… I simply adored them then, and still love them now. Although now that I’m a few years older and have developed a penchant for coffee, I like to add a dash of ground coffee beans to the cream! The texture of the cream remains delicate, but the flavour is slightly more ‘grown up’. This time, I thought I’d try Nespresso’s new Fortissio Lungo blend. If that doesn’t sound indulgent enough, the icing on the cake is actually the icing. Glossy with a crisp shell on the outside, soft and gooey underneath. 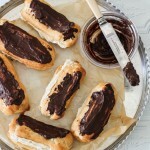 Eclair perfection! In case you don’t live near Edgecliff or any other fabulous fresh cream eclair vendor in town, here is the recipe and some Choux pastry tips. 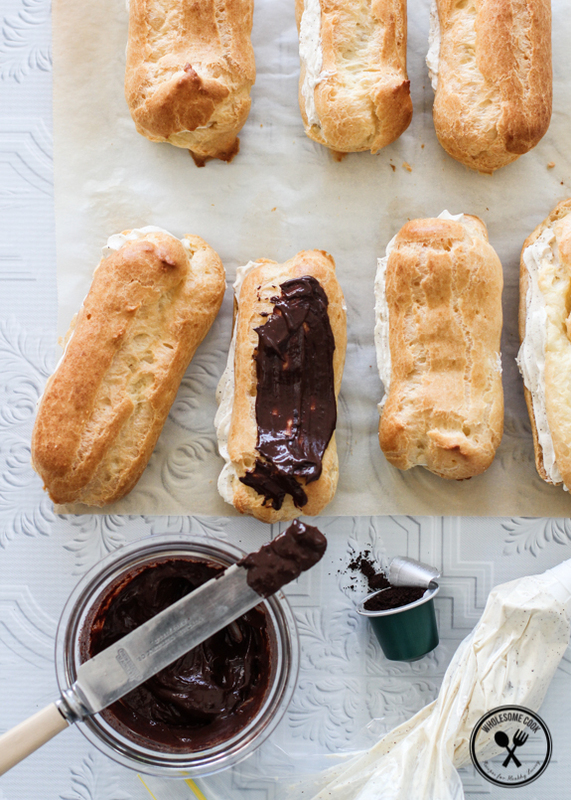 Hands down, this choux pastry recipe has never failed me. I have baked it in gas and electric ovens. In Sydney and overseas. I have made it into all of the aforementioned shapes and other sizes. I’ve used gluten-free flour and fried it as churros! The secret to this choux lies in simplicity. All that’s needed is water, butter, flour and eggs. No embellishments. No sugar. No anything else. I just have to remind myself from time to time that when an indulgent treat like this forms part of a fail-proof cooking repertoire, it must remain an occasional indulgence instead of daily dessert. The word occasional demystifies the French Paradox, doesn’t it? Best shared with friends. PS Since the pastry is savoury, you can use the pastry with savoury fillings or to make puff pastry “croutons” for soups. Okay. So it might look like a bit of a long recipe but it's quite simple. It's my go-to recipe when unexpected guests pop in because it's so quick. Since the pastry is savoury, you can use the pastry with savoury fillings or to make mini croutons for soups or fill the shells with savoury toppings. 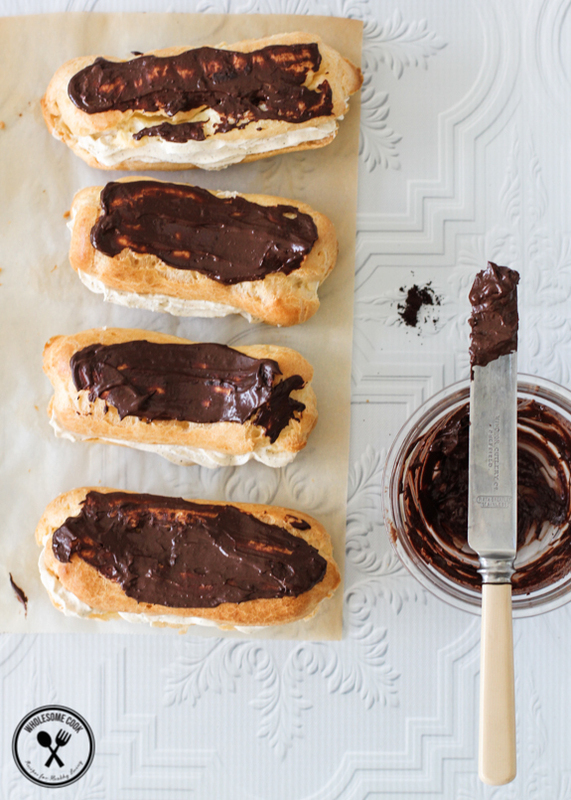 The ratio is also easy to make 3-4 eclairs with half the ingredients. For an even lower sugar version and If you don't want to glaze these with chocolate, you can simply dust them with cacao powder and add extra sweetener to the cream. In a small saucepan set over medium heat bring water and butter to a boil. Add flour and mix vigorously with a wooden spoon until the mixture comes away from the sides and forms a ball. This should only take a few seconds.Transfer dough to a mixing bowl and flatten to cool slightly. Add eggs and beat with an electric mixer or whisk until glossy and smooth (I use my Braun stick blender with a whisk attachment for single egg quantity like this). Using a 2cm round piping tip or a zip lock bag with a 1.5cm hole cut in it pipe dough into 4 inch long logs about 1 inch apart. In the meantime prepare the glaze and cream filling. For the glaze, place milk and chocolate in a small bowl and heat on medium high setting in the microwave for 20 seconds. Mix gently to melt and form a ganache. For the filling, beat cream with sugar (stevia or Natvia), vanilla and freshly ground coffee until firm peaks form. Store in the fridge until needed. Cut cooled eclairs in half horizontally. Fill each half with whipped cream, sandwich together and spread the top in chocolate icing. Place on a cool cookie tray and chill in the fridge for the icing to set. 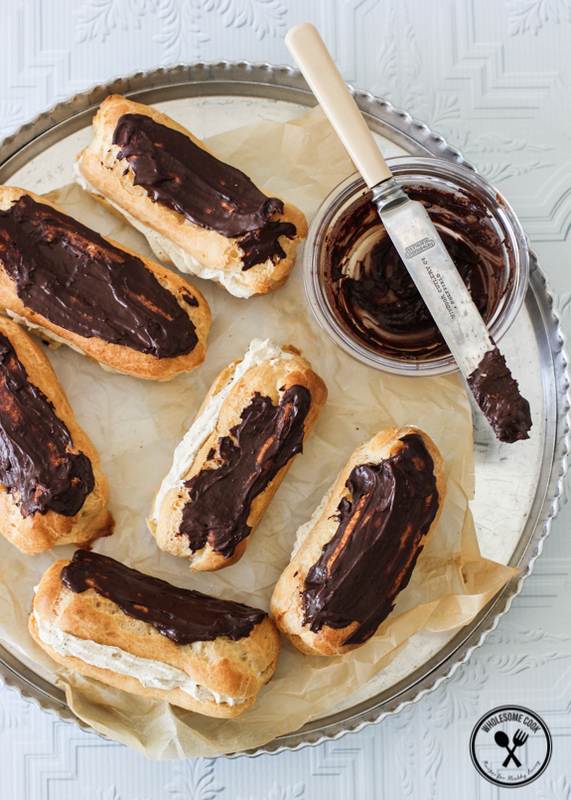 The eclairs should keep in the fridge for 2-3 days un-iced, or a day when iced. Finally! Someone has made a low sugar profiterole recipe that uses fresh cream. This way we can get to enjoy a little jam with it too. It is soooooooooo gooooooooood. Thanks for this. Printing for the weekend. You and Danielle it seems! I don’t like the fake sugary “creams” in most bakery eclairs that’s why I wanted to make mine this way. If you want them sweeter you can add a little extra sugar / stevia to the cream or use milk chocolate for the glaze. Don’t tell me you had them for breakfast… I saw your earlier post on Instagram. Did you? I guess being low sugar and containing eggs, flour, butter and cream it’s almost the same as having hollandaise eggs on toast with a hot chocolate. LOL Love them! See, some might see it as a lame excuse and an unhealthy treat, but it’s made with fairly pure ingredients and I only have these occasionally. My last one was in May and the one before that in March. It’s part of a special memory for me but I like to make sure I don’t over indulge. On my Martyna…I can’t wait to make these on the weekend!!! I am salivating at my desk :)…might have to pop some jam inside instead of the coffee…. Thanks for your comment 🙂 Jam in the middle (like a scone), now that’s a yummy idea. Or passionfruit curd whipped into the cream could also be nice with the chocolate. Enjoy lovely! Wow Martyna they look great going to do them this weekend low sugar yum thanks for your recipes I found your blog just yesterday so glad will do them with custard my boys love it many thanks again. Hi Rosemary, thank you for stopping by! I hope your boys will love them! For a slightly more indulgent treat may I suggest ice cream and custard. See, we only have dessert once a week (twice if I’m baking for the blog or clients), so we make it special. In a 90/10 kind of way. Eclairs get my husband’s attention in ways nothing else does. He’s not a dessert eater – unless a profiterole or eclair is involved. I think he’ll love these. He and I would get on fine then 🙂 Hope he enjoys them – some great inners suggestions in comments as well. thanks for sharing this.. i have tried my hand at choux more times than i care to admit without much success! I am so going to make these! 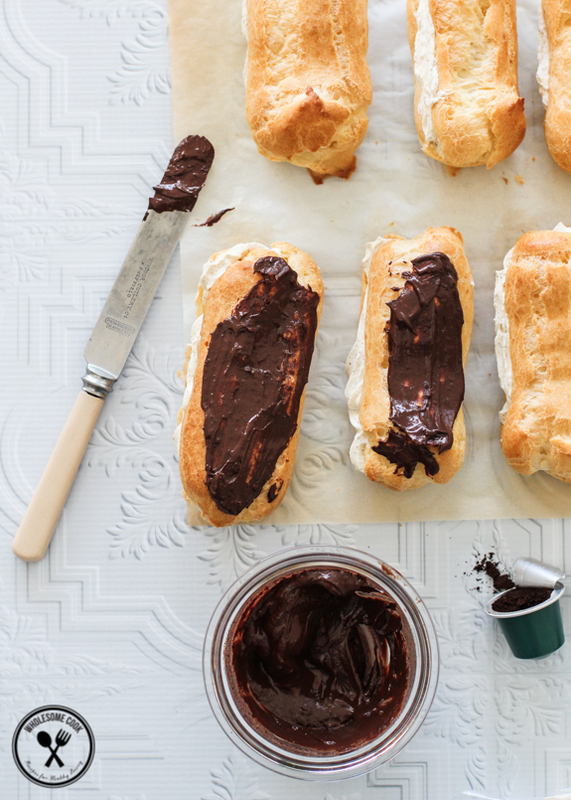 The coffee beans in the cream is enough to really spice up these eclairs! I have been wanting to try making choux for the the longest time. 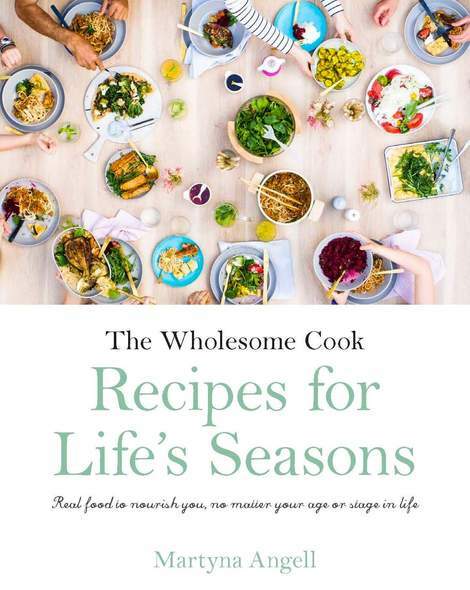 So happy you have made it look so easy and the recipe is sans sugar – mostly. Just wondering if you just open up the nespresso capsule and use the coffee like that in the cream? or do you extract the coffee first and use a teaspoon? Hi Debs, thanks for your comment. 🙂 I just cut open the capsule and use a teapsoon of the ground coffee inside. 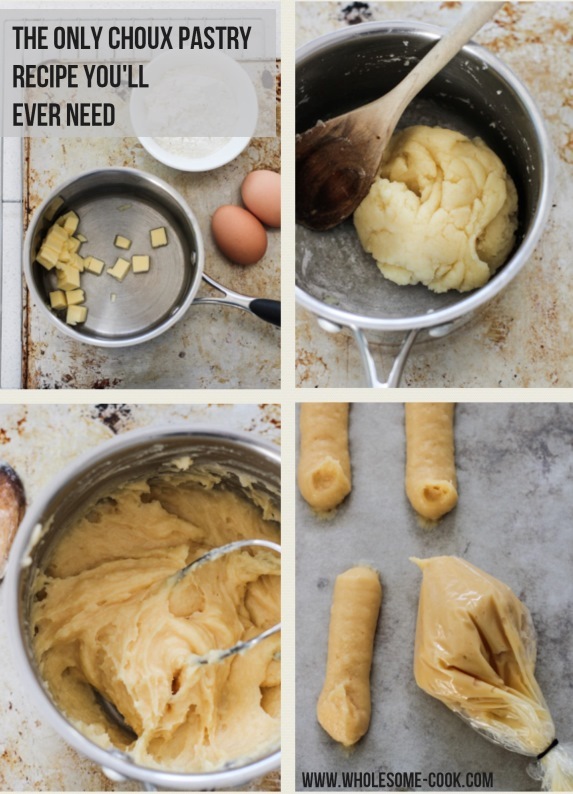 This is the most simple and perfect choux pastry recipe I’ve seen. Thank you for posting! Sadly, this didn’t work for me. I think the eggs were too large and the dough was way too runny because of it. I’ll try again when I have smaller eggs. So easy and delicious but the glaze was a bit runny for me, perhaps I shouldn’t have used cooking chocolate. Hi Filippa, cooking chocolate might have been the culprit in a runny glaze – next time maybe use a little less liquid or try to heat the chocolate only a little at a time. If overheated it tends not to set as well. I tried this today and they have the right taste but sadly did not rise. Any tips? Hi Joanne, perhaps increasing oven temperature by 10C or making sure that when you pipe / spoon them you add some height to them might help. 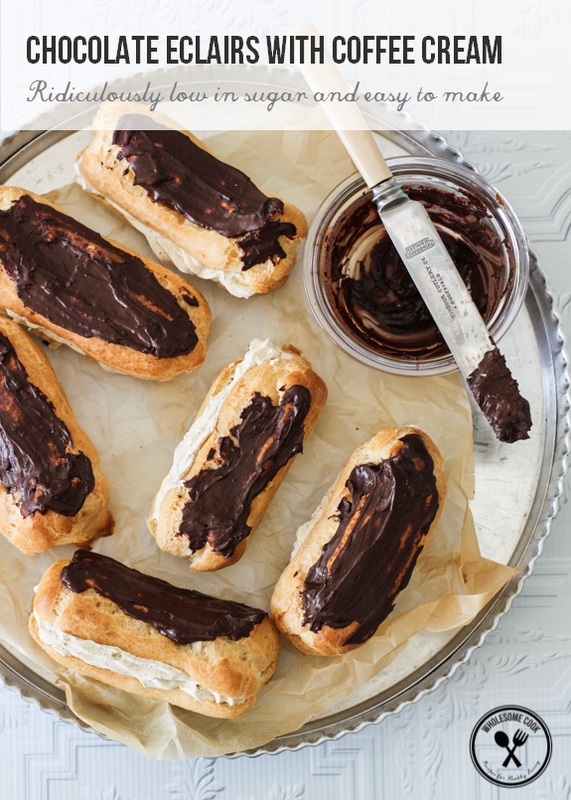 i’m wondering, is this a suitable recipe for someone who has never made eclairs/choux before? i want to make it so bad but i don’t know if i have the experience… any tips? Hi Piper, it really is a very simple recipe. Make sure you use pure butter (not spreadable butter / oil blends) and don’t be afraid of the recipe. Good luck, let me know how you get on. Hi, I live in Europe, is there any chance you could give me metric quantities for the cup measures similar to the butter & what size of eggs is best to use? Finally when you’re mixing the dough with the wooden spoon into a ball do you keep it on the heat? Hi Juicee, I use 58g eggs (weighed with shell) – I think by European standard they are small eggs. As for the butter, it is best to weigh it for most accurate results. Making these right now, but my pastries keep turning out flat. I take them out of the oven and they just deflate. Did you use self rising flour instead of all purpose flour?